If you experience loose, frequent and watery bowel movements, you have diarrhea. This condition occurs when your stool passes too quickly through your digestive system. Usually diarrhea lasts only one to two days, but it can persist if there is a serious problem. Certain foods, such as lettuce, have the potential to cause diarrhea. Lettuce might cause "traveler's diarrhea." This type of diarrhea occurs when Americans travel outside of the United States and eat contaminated food or water. You can prevent traveler's diarrhea easily. Lettuce is a likely culprit because it is grown locally and washed in local water. Prevent traveler's diarrhea by avoiding lettuce while traveling outside the United States. Also avoid tap water and uncooked food. Lettuce is a likely vehicle for foodborne illness, causing diarrhea. Food that has been improperly handled, packaged or washed contains parasites or bacteria, which lead to intestinal upset and diarrhea. In fact, in May 2010, a prominent distributor issued a major lettuce recall due to a foodborne illness that left at least 19 people sick. Always thoroughly wash lettuce before eating it. 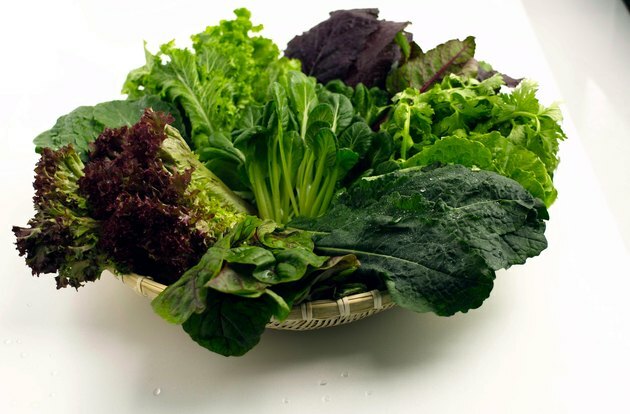 Lettuce is a good source of fiber, containing 1 g per cup. While fiber is an essential part of a healthy and well-balanced diet, too much fiber can cause an upset stomach, diarrhea and cramping. Limit your intake of fiber to 25 to 30 g per day. When adding fiber to your diet, do so slowly to avoid diarrhea. Diarrhea should not persist for longer than two days. If it does, contact your doctor. Prevent dehydration caused by diarrhea by drinking plenty of fluids. If your stools become pus-filled, bloody, black or tarry, make an appointment with your doctor. A fever of 102 degrees Fahrenheit or greater accompanied by diarrhea also warrants a trip to your physician.